I have a lot of color in my house but I don't have any kelly green. Strange thing is it's the one color I really want in my home but now, I'm not sure where it will fit. I like the idea of just bringing in the color through accessories, like this industrial pendant light. 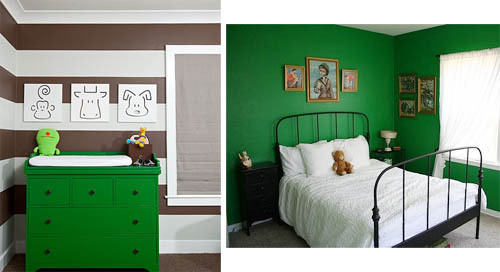 Paint and wallpaper are an easy way to add green. 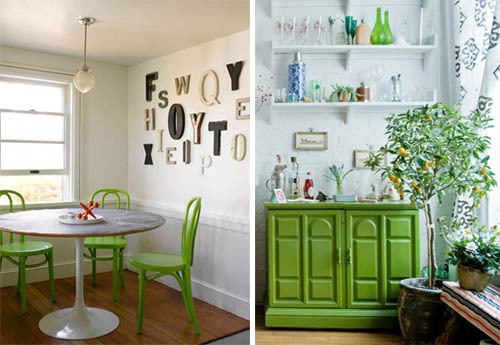 What I like too is that if you add fresh greenery in your home, it will instantly complement your green decor. Green is the color of nature. According to the Color Wheel Pro, "It symbolizes growth, harmony, freshness and fertility. Green has strong correspondence with safety." Adding "It is the most restful color for the human eye."